NEVADA: New Poll Show Dead Heat In Senate Race - Joe.My.God. September’s poll shows Democrat Steve Sisolak now holds a 2 percentage point advantage over Nevada Attorney General Adam Laxalt in Nevada’s hard-fought governor’s race. Laxalt had less than a 1 percentage point lead over Sisolak in July’s survey. About 15 percent of polled voters remain undecided about the race. 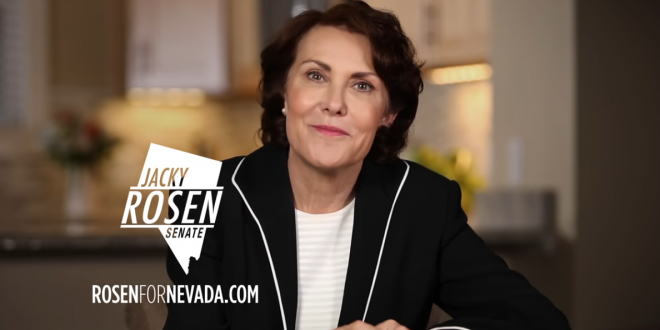 Democrat Jacky Rosen, the first-term congresswoman from Henderson, edged out Republican incumbent Dean Heller by less than a percentage point in the state’s highly scrutinized U.S. Senate race. Heller, like Laxalt, enjoyed a narrow lead over his Democratic opponent a few months ago.